It was decision time in Westchester County. 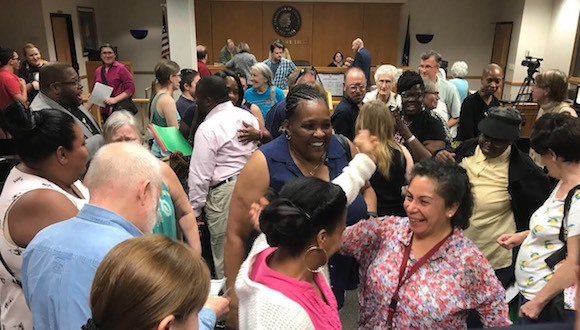 After three years of debate and a contentious four-hour hearing, the village council in Ossining – a quiet town sandwiched between the Trump National Golf Course and Sing Sing prison – voted to approve the Emergency Tenant Protection Act (ETPA). The ETPA is a New York State program that secures lower rent increases for tenants in municipalities that approve it. In Ossining, it will offer rent protection for as many as 1,800 households: it’s the largest expansion of rent stabilization in our state in over three decades. Ossining takes pride in its diversity, but has struggled to keep housing within reach of longtime residents. The ETPA has been around since the seventies, but few municipalities have adopted it since then. Community Voices Heard identified the ETPA as a key measure for keeping village residents in their homes – but that was just the first step in our journey. We chose rent stabilization as our focus not from a top-down approach, but as the result of an intensive, year-long listening process we began in 2014. We engaged working-class residents in Ossining around their anger, their hopes and their vision for greater dignity in their lives. Through canvassing, one-on-one conversations, house meetings, community-driven town halls, team-building and mentoring relationships with key leaders in the community, CVH Power built a solid foundation that endured and expanded over the course of this three-year struggle. 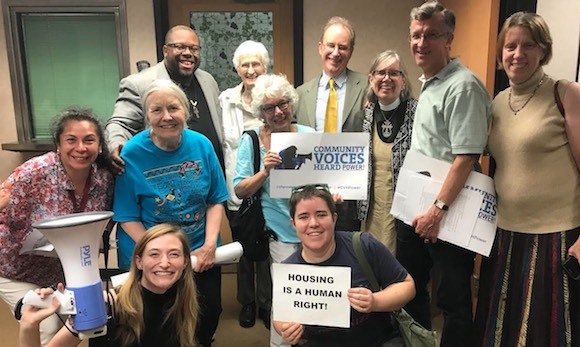 Ultimately, we were able to engage and build an alliance of tenants, homeowners, experts on rent regulation, students from the local high school and key institutions in the Ossining community, including the local Baptist and Episcopal churches. It’s this broad-based coalition that won the day in Ossining. Ossining has become a proving ground for the great need to enact reforms amidst one of the greatest housing crises our country has ever faced. And it’s proof that by organizing at the grassroots, we can take on the most powerful lobby in New York State and WIN. Indeed, on the heels of our victory, other New York State communities like Hudson are already considering ways to expand protections for tenants. And with a new generation of progressive lawmakers heading to Albany this January, we’re going to keep pushing for dignified housing for all New Yorkers. From our perspective at CVH Power, this campaign is a testament to the fact that long-term investment in a relational organizing model works, and that those most impacted must be at the forefront of any struggle for justice. Our member-leaders, not just in Ossining but throughout New York State, are now in a better position to move forward with confidence on an agenda for greater dignity for their families.